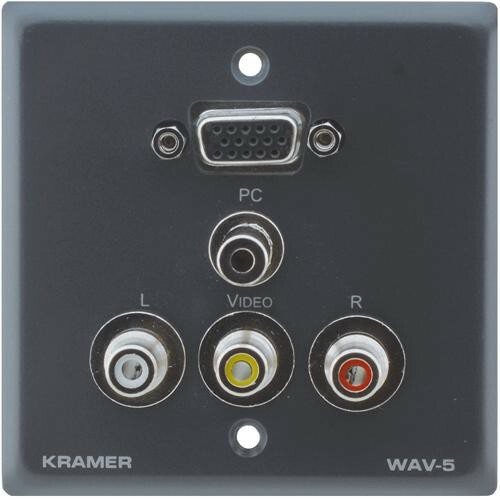 The Kramer WAV-5 Passive Wall Plate - 15-pin HD, 3.5mm & 3 RCA (Gray) is a computer graphics video, Composite video and stereo audio passive, single gang, wall plate. The WAV-5 has 15-pin HD female, 3.5mm female, and 3 RCA female front and rear panel connections. Box Dimensions (LxWxH) 6.9 x 5.1 x 2.2"
WAV-5 Passive Wall Plate - 15-pin HD, 3.5mm & 3 RCA (Gray) is rated 5.0 out of 5 by 1. Rated 5 out of 5 by Anonymous from Exactly What I Needed This wall plate attaches to a 1-gang box and allows for 1 VGA signal on HD15 connector, 1 audio connection on stereo mini, 1 composite video on RCA, and Left and Right audio on 2 RCA connectors. All 5 connectors are female on both sides. This allows for a nice clean installation. This product is easy to install and works very well.